Ultra-pasteurized. Foil lined premium pack to ensure freshness. Keeps fresh longer. Premium quality. A great holiday drink. Grade A. Homogenized. Born from a recipe dating back to Colonial America, Colonial Style Custard Nog is a rich and creamy beverage that gently blends eggs, milk, cream and sugars with just a touch of vanilla to produce a truly unique taste worthy of the finest egg custards - offering a delicious holiday drink alternative. 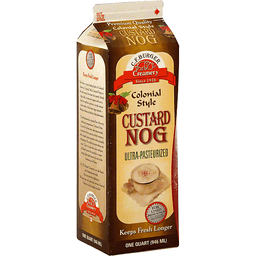 To authenticate the original flavor from its traditional preparation, Colonial Style Custard Nog has been ultra-pasteurized, a specialized heat process which assures a fresh, longlife dairy product when properly refrigerated. No artificial preservatives are used. Then it's placed in our exclusive foil-lined carton that provides a super-strong, light-tight barrier to seal in the freshness and flavor. At C.F. Burger Creamery, we take flavor and freshness seriously. you can taste the difference. We hope you will enjoy this revival of one of America's first holiday drinks. Since 1926, C.F. Burger Creamery has produced premium-quality dairy specialties. In a day when rich taste seems to be missing in many products, C.F. Burger Creamery products still deliver old-fashioned flavor. It's the flavor that's been enjoyed for generations.